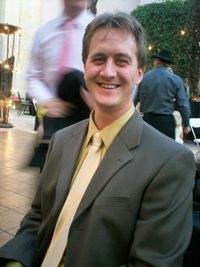 Brian D. Taylor was born and raised in Marlow, a small, rural village in southwestern Oklahoma. While spending his childhood running through the fields and developing a healthy fear of cows, he always had a very active imagination, creating and acting out stories about the land and the animals and good versus evil, but he didn’t realize he was a playwright. Growing up in a very large family, he always wrote and directed plays for his cousins to perform for the grown-ups, but he didn’t realize he was a playwright. In high school, he took a drama class entirely by accident. It changed his life and helped him realize his passion for the arts, but he still didn’t know he was a playwright. In less than a week of classes at the business school at the University of Denver, he quickly decided he’d rather hang out with the theatre kids and so changed his major to theatre and never looked back. His time there required a playwriting class and he began to write plays. It was a fun experience, but his professors were hoping for the next Pulitzer Prize winner and turned their noses up at his work. He began to actively write scripts, but failed to finish them because the editor who lives inside his head was constantly finding flaws with them. Upon graduation from college, he looked into the future and wondered what he wanted his life to be. He chose to teach drama so he could always be working on a show and might be able to inspire a love for the arts in his students. He thought it would be nice to write plays in the summertime. If only the playwright that lived inside his head could finally conquer the editor. After several wonderful years of teaching drama and writing the first acts of hundreds of plays, Brian found a job that would finally allow his inner editor to express himself. He became an editor at Pioneer Drama Service, a publisher of sweet plays and musicals. It wasn’t long before the playwright inside of him was longing to express himself, too. And so the battle of a lifetime began. After a month of inner warfare, the playwright and editor had hammered out Brian’s first play, Revenge of the Pigs, and discovered that, instead of mortal enemies, they were really the perfect teammates. You can read more from Brian on his blog. Or interact with Brian via Twitter handle @bdtaylorplays or on Facebook.